Food Memories: 65. Eggs Benedictive - Not Duck Eggs! I grew up eating traditional-white, mass-produced eggs. Today, we have free-range, hormone-free, antibiotic-free eggs. The prices are hefty, but they do taste better than the mass produced eggs. If you are lucky to live near a farm, you might be able to purchase wonderful, fresh eggs. Watch out, though. An unscrupulous farm woman in Missouri told me the eggs she had for sale, were jumbo chicken eggs. After I returned home, I discovered they were duck eggs! The flavor was quite different and I could not get past the sight of the huge yolks surrounded by very little egg white; it was visually unappealing. While today we have more egg choices, my childhood included eggs which were not a salmonella health threat. In fact, my mother put a raw egg in a glassful of juice and drank it - it was some kind of protein drink - I cannot remember why she thought she needed it, but I could not have swallowed a raw egg no matter how great it was supposed to be. Too bad my mother did not have the internet - she would have found out that the protein in cooked eggs is nearly twice as absorbable as the protein from raw eggs. *Hint: Most restaurants make a poor version of Eggs Benedict, but if you are even in New Orleans, try the Eggs Benedict at Brennan's. Fabulous! 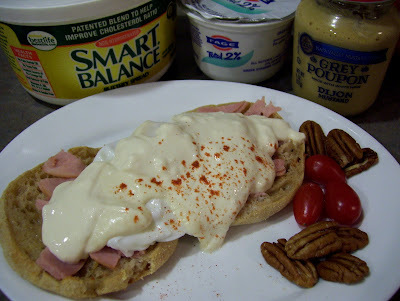 Today's recipe is my own variation of a mock-Eggs Benedict dish. It eliminates many of the offending calories and fat and the sauce is simple and is not temperamental. Combine sauce ingredients well in a microwave safe bowl; set aside. Heat a med. pot with 2 inches of water and bring to a boil and lower temperature until it has a slow, steady boil. Break the egg into a small dish and slip the egg into the pot of water. Cook for 3-5 minutes (3=runny, 5=firm). Meanwhile, toast bagel. Put the cut ham in a small dish, cover and heat for 20 seconds in the microwave on HIGH. Remove, set aside. Heat the sauce, covered, for 20 seconds in the microwave on HIGH, stir. Put toasted bagel on a plate, spread well with Smart Balance. Layer bagel halves with warm ham pieces. Remove egg from water with a slotted spoon and set on bagel half. Ladle sauce over egg and second bagel half. Sprinkle with paprika if desired. Serve immediately. *Note: Greek yogurt is available in most grocery stores. Both are healthy according to me, either egg of duck or chicken.